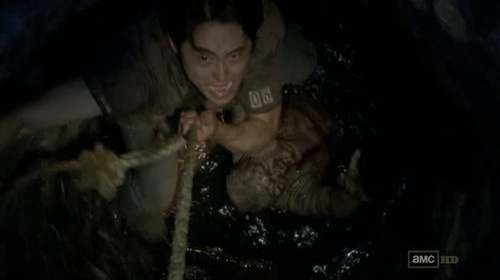 The only zombie we see during this episode figures in a preposterous set piece that is constructed like a joke: How many morons does it take to get a walker out of a well? The zombie itself—a bloated, waterlogged monstrosity, like a giant, clammy baby—is a masterpiece of disgusting creature design, and I rather like the focus on a single, practical problem: they don’t want to shoot it and contaminate the water, so how do they get it out? The way our intrepid band of survivors goes about solving this problem, however, does not give me hope for humanity’s prospects. “Hey, I’ve got an idea: let’s tie this thin rope around a couple of rusty pipes and lower one of our friends down the well! No, no, don’t bother to check the structural integrity of that rotting pump we’re anchoring it to. Even though it’s already wobbling as we tie the rope to it, I’m sure it’s strong enough to hold one nimble Asian man.” If this is what the combined brain-power of the remaining gene pool can come up with, I vote that we put the zombies in charge. If there’s a thin thematic line that runs throughout this episode, it’s these comforting narratives we tell ourselves, and each other, to ease the pain, to give us hope, to make life bearable. Rick (Andrew Lincoln) lies to his son about Sophia, for example, out of the best of intentions, but he feels guilty nonetheless. Herschel (Scott Wilson) tries to get Rick to see the hand of God in his own story, providing the counter-narrative to the more pessimistic, atheistic line that The Walking Dead usually follows. As we saw last week, it’s not divine intervention but human deeds that make life bearable, that are as close as we’re going to get to grace on this zombie-populated earth. 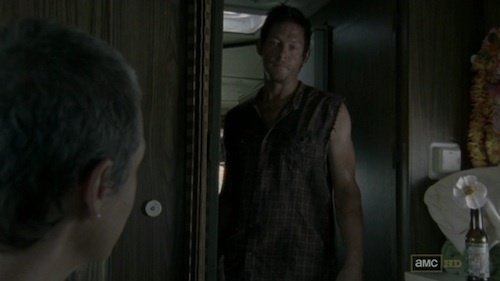 Rick convinces Herschel of that, arguing that the old man should let the survivors stay on the farm. “If you saw how it is out there, you wouldn’t ask [us to leave],” he tells Herschel. “You’re a man of belief: if you believe anything, believe that.” Faith means little, it’s our actions that matter, and how we choose to live. Darryl continues to be one of the more interesting and likable characters to me, and I’m starting to wish he had more to do. In fact, it’s an issue with this show that I like all of the supporting characters more than I like our three supposed leads: I find I get bored whenever Rick, Lori, or Shane are on-screen. 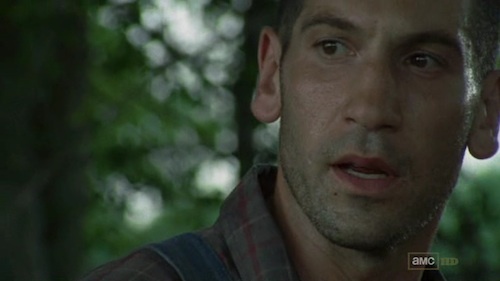 (The episode ends with the revelation that Lori is pregnant: we’re clearly supposed to wonder Shane or Rick is the father, but I just don’t care: none of the three sides of this triangle are particularly interesting to me.) Part of the problem is that all three are so dour and joyless: we see other characters have moments of friendship and humor—the Glenn and Maggie scenes are a good example—but the supposed leads remain one-note characters, and the notes are dull and monotonous and depressing. I’m tired of Rick’s noble bearing of his responsibilities; I’m tired of Shane’s bitter and angry attitude; I’m tired of that pinched, worried look on Lori’s face. It’s probably too much to hope that all three become zombie fodder, but I’m a little encouraged to see the rest of the ensemble getting more to do, and I hope the show continues to move in that direction. I hate to beat up on the show’s writers, but little things drive me crazy. Did Lori really send Glenn to the drugstore with the brand name of a product, without telling him what the product was? That’s ridiculous, and impractical, and something no one would do except to preserve the (obvious) answer until later in the episode. Good thing the (looted and ransacked) pharmacy happened to have a “True Blue” brand pregnancy test, or else Glenn would have come home with a box of condoms and some baby shampoo. In the interest of full disclosure, I should admit that I’ve begun reading the source material, the series of graphic novels written by Robert Kirkman. I plan to keep revelations from the comics out of these reviews, but the show has strayed far enough from Kirkman’s story that I don’t think I risk spoiling myself too much: there are major plot lines (like the CDC) and characters (like Darryl) who haven’t appeared at all in the books, at least so far. Speaking of revelations and spoilers, I won’t be specific, but I so wish the preview of next week’s episode had left out certain things.